If you want to learn where to trade the best cryptocurrencies & tokens, you have landed in the right place. Here at CoinSutra, we often keep a check on good cryptocurrencies as well as good exchanges where you can trade your cryptocurrencies. 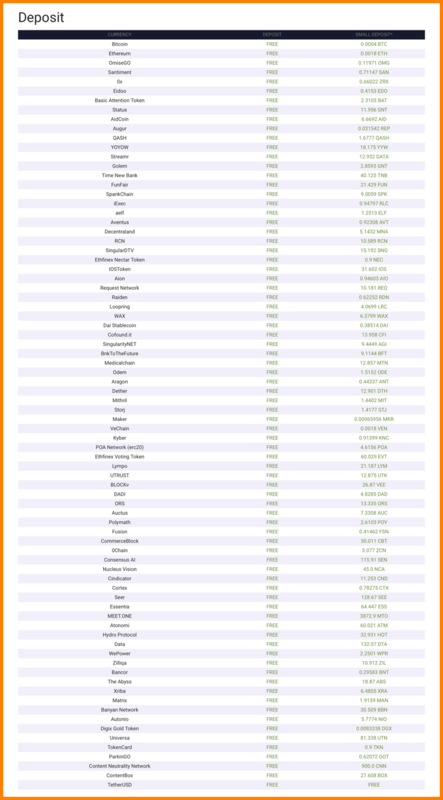 We have covered a lot of exchanges in the past after thoroughly reviewing them. On similar lines, the exchange we are covering today is a little different and rather interesting compared to the rest of the exchanges we have covered on CoinSutra thus far – Ethfinex. I stumbled upon this exchange while researching for decentralized exchanges (DEX). 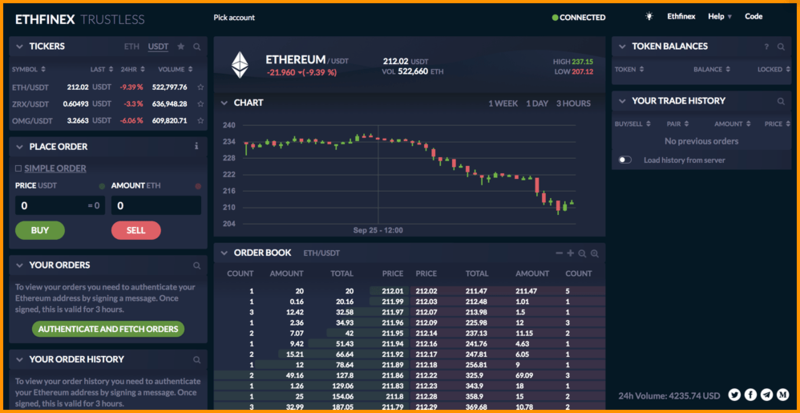 Those of you who know about Ethfinex might argue that it is not a decentralized exchange, and I agree. However, sooner than later, it will be one of the best DEX you will ever see in the market. 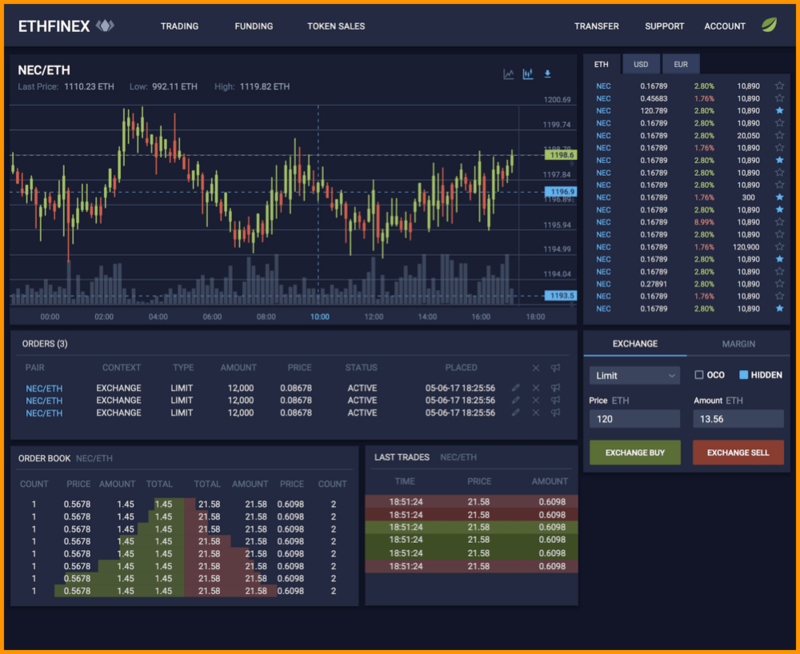 Ethfinex is another exchange launched by a famous Bitcoin exchange Bitfinex. And as the name suggests, no rewards for guessing, ‘Ethfinex’ is an exchange specifically dedicated to trading Ethereum-based tokens, also known as ERC20 tokens. Ethfinex is currently launched as a centralized exchange, but in due course of time, it will transform itself into Ethfinex DEX that will power the tokenized economy of ERC20 tokens. It plans to do so by introducing new native token in its ecosystem called Nectar token about which we have already covered in detail here: Ethfinex’s Nectar Token Is Here And Its Here To Stay! The exchange is currently in the Beta phase and not ready for full-fledged trading. But if you are an early adopter of new technologies, you should give it a shot. 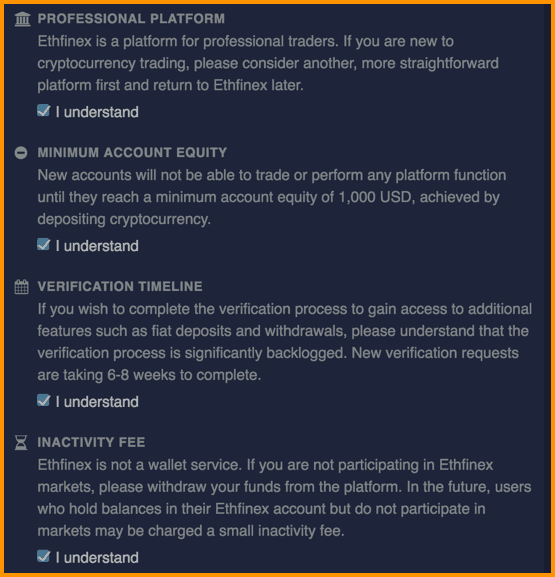 Registrations on Ethfinex are pretty straightforward, just like any other crypto exchange. You need to sign-up using your email ID and complete a KYC after it. The KYC process can take up to 6-8 weeks, so the earlier you start, the faster you will get the access. Here, the guides for identity verification for individuals and businesses. 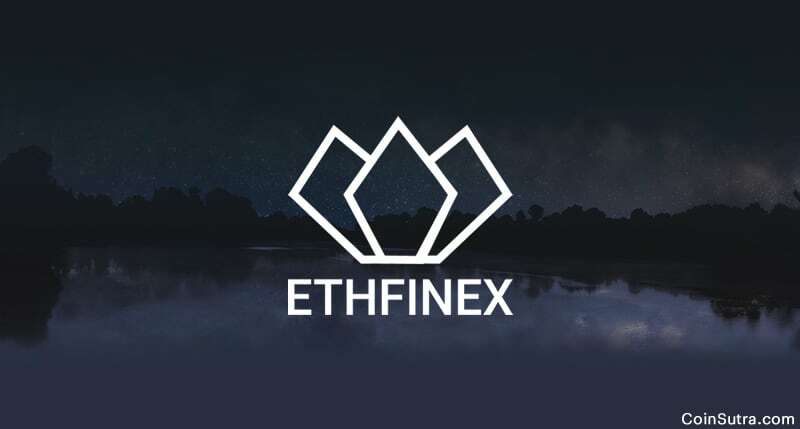 However, to attract serious traders they have kept some terms and conditions that you need to accept before singing-up on Ethfinex. Also, On Ethfinex, if you are a pro-trader, you will find advanced trading tools such as limit orders, stop orders, trailing stop, fill or kill, TWAP, and others, along with different market charts for various intervals so that you can decide wisely. Ethfinex is strictly for non-US residents only because their NEC-Nectar token is viewed as a security threat under US laws. Other countries like Japan, Canada, Australia, India, Korea etc can actually use the exchange in a hassle-free manner to trade ERC20 tokens. There is no doubt that Ethfinex is a legit exchange and is going become one of the leading exchanges for ERC20 tokens very soon. Moreover, it is backed by the Bitfinex team which is already experienced in running a very successful Bitcoin exchange for years now. So they bring their expertise of security and infrastructure with them for Ethfinex too. Market makers trade throughout the month. 50% of total trading fees paid by the makers and takers are pledged to the token smart contract every 30 days. NECs are issued at the end of each month and distributed to market makers in proportion to the total trading volume they conducted throughout that month. A redeem mechanism will allow holders of the NEC token to claim a reward at any time, using up their tokens to do so. 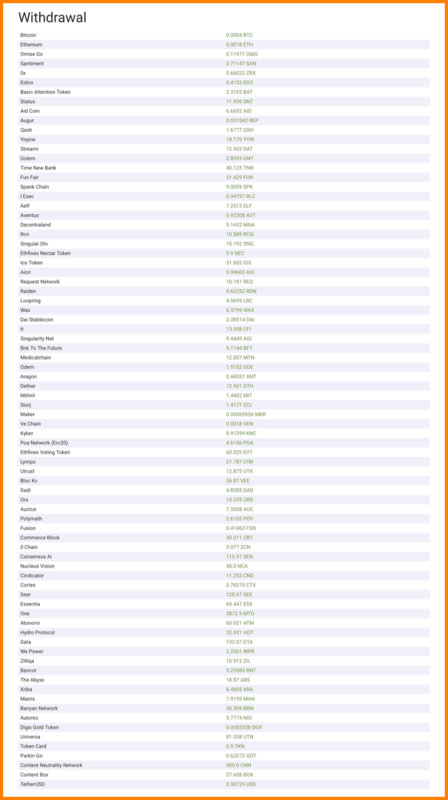 This reward is equivalent to 50% of the trading fees collected throughout each period. Additionally, there are high chances that the price of NEC might appreciate in the future because of the additional privileges stated above. That’s why the good thing, for now, is to log in to Ethfinex using your Bitfinex credentials and register on www.ethfinex.com/nectar. Also note, to participate in the Nectar market maker program, you need to do a complete KYC verification beforehand and it can typically take days before you are approved. Therefore, plan accordingly if you wish to get NEC tokens early. Note: US individuals are not allowed to earn or trade Nectar token (NEC). Update: These features and opportunities are now live on Ethfinex. Plus now you get a new token called EVT-Ethfinec Voting Tokens if you are holding NEC tokens. For example, if you hold 10,000 NEC on the date of the vote beginning, you also receive 10,000 Ethfinex Voting Tokens (EVT). It is time to hear from you: Are you buying NEC tokens? Do think Ethfinex has it to become the next big exchange like Bitfinex? Do you think Ethfinex DEX will rule the ERC20 market? Let us know your thoughts in the comments below. Like this post? Don’t forget to share it with the world!